Prairie Creek Redwoods State Park is home to the second largest remaining stand of uncut, old growth redwood forest left in the world. 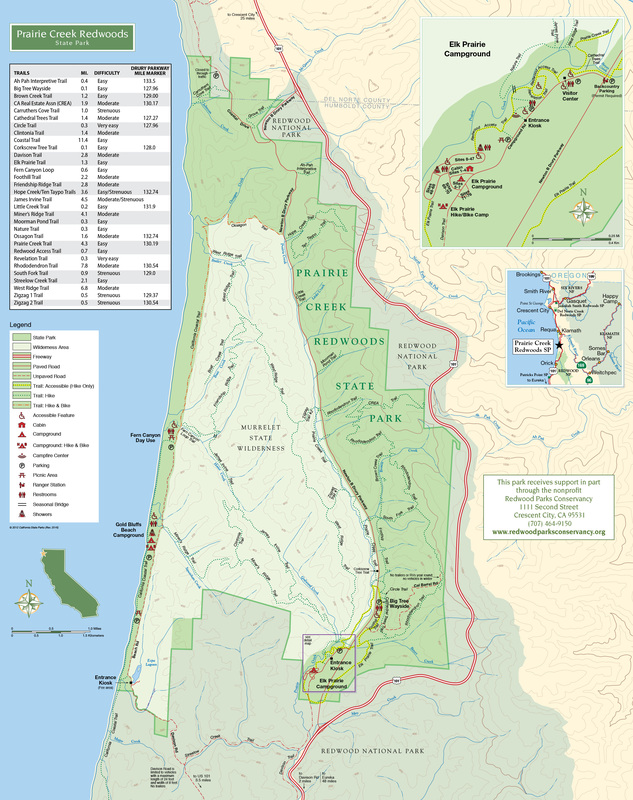 Prairie Creek Redwoods State Park has over 70 miles of trails to explore. These trails vary greatly in distance and difficulty. The park has two wheelchair accessible routes through old growth redwood. The Revelation Trail is a ¼ mile interpretive accessible loop right behind the Prairie Creek visitor center. The 2 mile Prairie Creek / Foothill loop also starts at the visitor center. Two of the more challenging hikes are The James Irvine Trail and The Rhododendron Trail. The James Irvine is a 10 mile traverse through old growth forest, Fern Canyon, (hikers can continue west to the Pacific Ocean) then back again. The Rhododendron / Brown Creek / Foothill loop is a magnificent hike that ascends over 1000 feet. .
Make sure and stop by the Prairie Creek Redwoods State Park Visitor Center and talk to the knowledgeable staff that will help you find the perfect trail to explore. A spectacular 12 mile loop of the James Irvine Trail, Fern Canyon Loop, Beach Rd & the Miner Ridge Trail is a worthy all day hiking adventure. Remarkably, you are routed through the old growth forest into a lush watery canyon with fern covered walls, along a short road to the breathtaking, oxygenating ocean at Gold Bluff Beach & return through ancient forest on an entirely different path. If you are prepared to carry all you need on the trail, & would like to stay at the Gold Bluffs Beach campground along the way, come into one of the Redwood National and State Park visitor centers & get a back country permit. If you prefer a shorter excursion, the Miner Ridge, Clintonia, James Irvine loop is just 6.8 miles. The trailhead for these hikes is right at the end of the parking lot just outside the visitor center. A majestic 8.7 mile loop of the Cathedral Trees, Rhododendron, Brown Creek & Foothill Trails is another remarkable adventure. Beginning across the street from the visitor center, this hike climbs 1050 feet to Cal Barrel Rd & guides you through spectacular forest diversity. If you wish to see the glorious Brown Creek Trail, but would prefer a shorter hike, just park along our Newton B Drury Parkway at mile marker 129. The South Fork, Rhododendron & Brown Creek Loop is just 3.6 miles. An incredible 5.8 mile loop of the Westridge, Zig Zag 1 & Prairie Creek Trails is also well worth your time & energy. This loop ascends about 760 feet through the redwood uplands of Westridge to the lush southernmost part of our spectacular Prairie Creek Trail. If you envision a longer journey, continue on Westridge all the way to Zig Zag II before descending Prairie Creek for a 8.2 mile adventure.